In January 2018 the government and the INC (Instituto Nacional de Cultura – the governing body over Machu Picchu) made known the new regulations for all visitors and visits to Machu Picchu. For more the details on these new rules, please have a look here; http://www.howtotraveltomachupicchu.com/content/new-entrance-rules-machu-picchu. When these rules became public it provoked quite a shock with the community of travel agents and service providers and initially provoked more questions than the clarity these rules were supposed to bring. Now almost a year working with the new rules, how do these work out in reality? Well as expected a lot of these regulations are hard to impose so the INC has taken the soft approach to a lot of these newly applied regulations. Following we will go over the main ones. Please keep in mind that the following information is based on the actual experiences from our guides and guests during the high season of 2018 (May through September). Be aware that the official rules have not been modified and the way they are applied is open to interpretation from the INC. Entrance times & re-entrance One of the main changes is that instead of selling day tickets now tickets have a certain time slot; either 6.00am till 12.00pm or 12.00pm till 5.30pm. Machu Picchu does not open before 6.00am (unless you are Mick Jagger) so for the morning tickets the entrance time remains as such. Nevertheless as there are no check points once inside of Machu Picchu the exit time is not really checked upon. Therefore you can easily stay after noon at the site with the morning ticket. However, please keep in mind that you will not be allowed to re-enter after noon in case you would need to use the restroom (these are located before entering the site). For the afternoon ticket there is flexibility on the time they allow you to enter. In general people with the afternoon ticket are allowed to enter from 10.30-11.00am onward and stay till closing time. After 4.00pm they will not allow you to re-enter the site anymore. Remember that Huayna Picchu and Machu Picchu Mountain can only be climbed in the morning during one of the two time slots foreseen for each hike. Obligatory Guide for the first time visit The official rules now also state that for all first time visits you need to be accompanied by a guide. The guide must be an official licensed guide and cannot guide more than 16 people at once. This rule has not taken effect so far. When showing up at the gate without a guide they may recommend hiring one (there are guides available at the entrance) but will not push for this. With a simple “I have visited Machu Picchu before” this hurdle is taken in most cases. This being said, with the new circuits (see below) it is often handy to get a guide as they know the timings where and when it is most crowded as well as explain you how to get to the outer laying parts of the site. Apart from this Machu Picchu is a site where a good guide can provide quite some added value as they will allow you to see things you would normally not pay attention to. Obligatory visitor circuits Where before 2018 you could visit Machu Picchu following your own (or your guide’s) nose, nowadays this is no longer possible and three possible circuits have been created. Two separate ones and one that combines both – the one that most visitors do. Therefore it is no longer possible to wander around for most parts of Machu Picchu. Nevertheless the large circuit ends at the “Guardman’s House” the place from where most famous pictures of Machu Picchu are taken. Around this area there are some terraces with great views of the site where one can relax and enjoy the views. 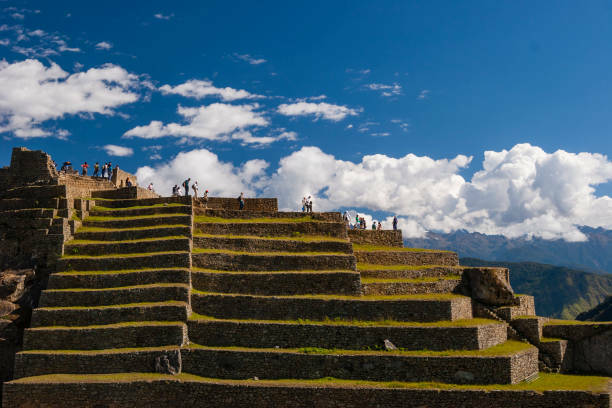 From here one can also hike to the Sun Gate or the Inca Bridge, two outer laying parts of the site that can be visited with the normal ticket. Huayna Picchu and Machu Picchu Mountain visitor limitations The visitor limitations for Huayna Picchu and Machu Picchu Mountain go back a couple of years before 2018 but was made official with the rules in 2018. As in earlier years the times for these climbs where managed with quite some flexibility and even between days, this flexibility is no longer existing. Therefore when purchasing your tickets for these hikes, make sure you will be able to enter the climb at least within one hour after the time slot starts, otherwise you may not be allowed to enter. For Huayna Picchu these slots are 7.00am or 10.00am and for Machu Picchu Mountain 7.00am or 9.00am. Both hikes are open till noon when everyone has to come down. It takes about 20 minutes to get from the entrance to the check point of each of the two hikes. This is an overview of how the new Machu Picchu rules in reality have been implemented the past high season. So far there is no indication that this will change in the nearby future but changes cannot be discarded of course – we will keep you posted.